Let me start by telling you I love and adore this cake. I want to get that out of the way because I’m going to quibble with the nomenclature and I don’t want my digression to in any way obscure my main point. Which is: YUM! First of all, “snack”? That’s a nice world to live in. Personally, I don’t “snack” on chocolate cake with chocolate frosting but I envy those who can. When it comes to snacks, I either have to chose between a banana or anything else plus an extra 30 minutes on the treadmill. I guess that “snack” part of this cake is the fact that you could, in theory, eat it with your hands since it’s just one layer. “Skillet.” I’m still not sure what cooking it in a skillet does. The authors say it gives the edges a nice crispiness but I didn’t find it that pronounced. It is fun to cook a cake in a skillet and I guess, theoretically, you could make it when camping. As long as you remembered to bring your solar-powered stand mixer. Finally I question “Quick.” No, it’s not the most time-consuming cake I’ve ever made but the cake itself has several components: the melted chocolate mixture, the dry ingredients, the butter/shortening combo, and the buttermilk. All need to be prepped and added at the proper time. And it’s got a frosting that requires you to melt down more chocolate, cream some butter and put it all together. The “quick” I had in mind was dump some liquid ingredients into some dry ingredients, stir, and pour into the skillet. But, it is not, I repeat, NOT a difficult cake to make. As I said, I absolutely loved this cake. The authors say the small amount of vegetable shortening is necessary to give it its “springy texture” and I think the texture is brilliant. 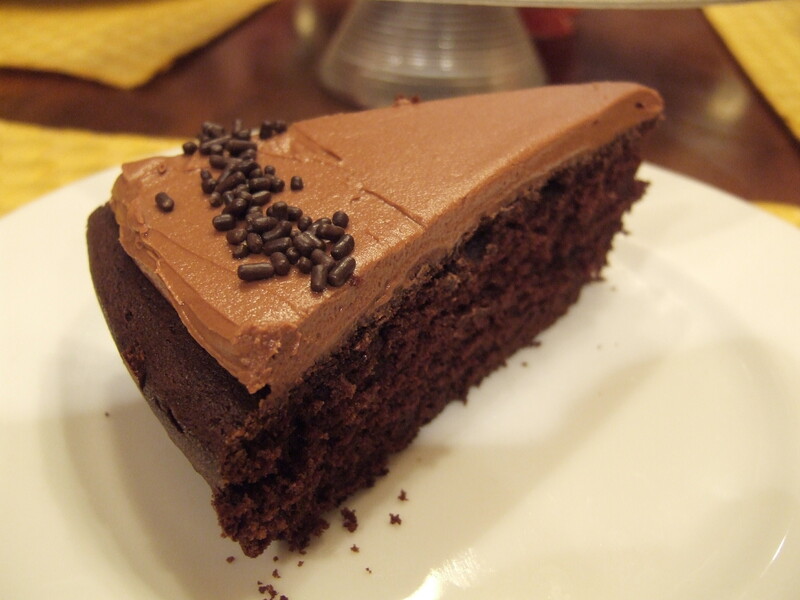 It’s also moist, has excellent chocolate flavor and the frosting is truly the work of angels. As much as I love layer cakes, I don’t miss the layers here. There’s something just very straightforward and simple — in the best possible sense of the word — about it. Grease a 10″ cast-iron skillet or ovenproof stainless-steel skillet with butter. (The heavy, dark-colored cast-iron skillet will make the sides of the cake more crispy than a stainless steel one.) Line the pan with parchment paper and butter the parchment. Dust the parchment with flour and knock out the excess. In a small, heatproof bowl, whisk together the cocoa powder, chocolate, and espresso powder. Add 3/4 cup very hot water, wait 1 minute, then whisk the mixture until it is melted and smooth. Set aside to cool. In another small bowl, whisk together the flour, baking soda and salt. In the bowl of a standing mixer fitted with the paddle attachment, beat the butter and shortening together on medium speed until creamy, 2-3 minutes. Add the sugars and vanilla and beat until fluffy, about 3 minutes. Scrape down the bowl, add the eggs one at a time, and beat until just combined. Turn the mixer to its lowest setting, and in a slow, steady stream, add the reserved chocolate mixture. Scrape down the bowl again, then turn the mixer to low. Add the flour mixture in three parts, alternating with the buttermilk, beginning and ending with the flour mixture. Scrape down the bowl, then mix for a few more seconds and pour the batter into the prepared skillet. Smooth the surface with a spatula. Bake for 40-45 minutes, rotating the skillet halfway through the baking time, until a toothpick inserted in the center of the cake comes out clean. Transfer the pan to a wire rack to cool for about 15 minutes. Run a paring knife around the sides of the pan and flip the cake out onto a cooling rack. Turn the cake right side up and let it sit on the rack until completely cool. In the bowl of a standing mixer fitted with the paddle attachment, beat the butter on high speed until creamy, about 2 minutes. Add the confectioners’ sugar all at once and beat until completely blended, about 2 minutes. Add the vanilla and beat for 15 seconds. Scrape down the bowl and add the melted, cooled chocolate. Beat until smooth, continuing to scrape down the sides of the bowl as needed until the frosting is uniform in color. Transfer the skillet to a cake board or serving platter. 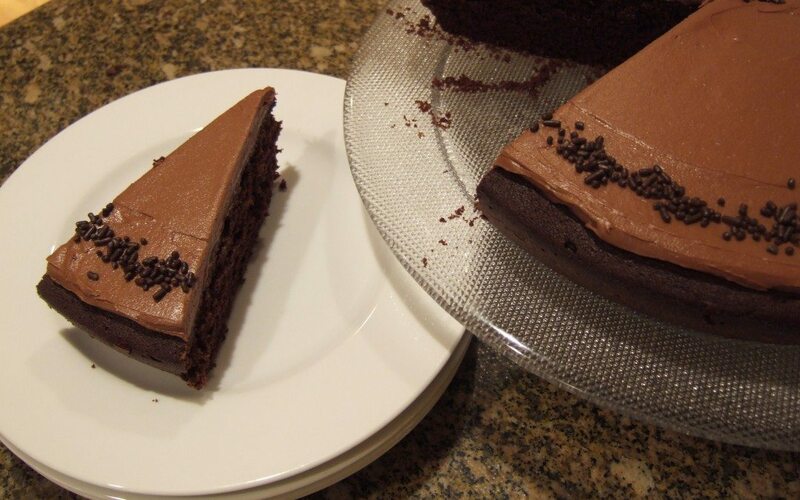 Use an offset spatula to spread the frosting evenly across the top. Serve it immediately or refrigerate it, if necessary. Bring it back to room temperature before serving. Sounds like a lovely cake. I try and so something like that once a week to have around for tea in the afternoon. This week I did mocha brownies, which were well, okay. Next week I’ll try this. I do own the book. Also in this book, you might enjoy the Double-Chocolate Loaf with Peanut Butter Cream Cheese Spread. I didn’t bother with the frosting and instead served with the a home made pistachio ice cream. Yum!